They say a writer should write about “what they know.” George Carlin knew radio broadcasting and, more importantly, how to parlay his experience and expertise into national stardom. For George, the chip didn’t fall far from the Blarney Stone. George’s father, Patrick, an advertising manager for the Sun newspaper, was a skillful after-dinner speaker who won a nationwide Dale Carnegie public speaking contest in 1935. His parents split up when he was an infant, and with his mother working long hours, George would spend a lot of time alone at home after school, which he enjoyed because it gave him the opportunity to indulge in humor magazines such as Ballyhoo, a parody magazine packed with advertising spoofs that heralded the content of dozens of Carlin’s commercial take-offs to come. The radio gave Carlin another world of comedy to absorb. With an already sophisticated sense of humor, he could enjoy radio personalities who turned American conventions upside down with satirical comedic commentaries, such as Fred Allen and the acerbic Henry Morgan. As a child at summer camp, George received an award in a talent show for delivering comic monologues that he remembered from his favorite radio performers. It remained one of his most treasured possessions throughout his life, along with the mahogany gavel his father had been awarded for his winning speech. Recognizing his burgeoning gift for language, his mother encouraged him to use the dictionary to look up a word if he was not sure of its meaning. When Carlin was 10 years old, he saw Danny Kaye in the film “The Secret Life of Walter Mitty,” the story of an unhappy man who escapes from the stress of his life into the vivid imagination of his daydreams. Carlin was captivated by Kaye, who had a dazzling proclivity for delivering tongue-twisting comic dialogues. Like Carlin would acquire, Kaye had a talent for vocal gymnastics. When he was 13, his mother gave him a tape recorder and he started taping himself doing parodies of newscasts and sports reports of the Brooklyn Dodgers, including sound effects, such as a loud exhalation of breath to simulate a crowd roaring in the bleachers. Carlin dropped out of high school and joined the Air Force when he was 17. His plan was to use the G.I. Bill to cover the cost of broadcasting school. He was assigned to Barksdale Air Force Base in Louisiana. Not finding the military any more engrossing than school, he was always in trouble, He was court-martialed three times in addition to many other more minor offenses. He met local DJ, Joe Monroe, who offered him a job at his station KJOE. George got permission to work at the station; his commanding officer thought it would be good for community relations, as well as possibly keeping Carlin out of trouble. Not quite. As a DJ, he enjoyed some of the perks of the job, receiving free pizzas and booze from distributors who wanted him to give their records airtime. One night, on the air, he began drinking a fifth of liquor he had received as a gift. The drunker he got, the more he made fun of life at Barksdale AFB. Several minutes later, at the end of a song, there was dead air. MPs from the base had gone to the station and hauled Carlin to the guardhouse. After the Air Force, Carlin enrolled in the Columbia School of Broadcasting…he quit after 2 weeks because he realized that the school couldn’t teach him anything more than he had learned on the job at KJOE. He landed a job hosting at Boston’s WEZE, but was fired after only 3 months because he took the station’s news van to NYC to buy some marijuana. There had been a prison break at Walpole that they couldn’t cover. Carlin’s argument to the station manager was that prison breaks happen all the time; they could just cover the next one. They still fired him. In 1958, Bob Arbogast, a DJ and comedy writer, wrote and performed a hit 45 single “Chaos Radio, (KOS)” which sold 10,000 copies in three days, and then was banned from radio play on the fourth day, when stations realized that it parodied “Top 40” radio. It featured rapid-fire patter, song and commercial parodies, and an update of late baseball scores: “5 to 1, 14 to 3.” The similarities to Carlin’s later radio routines of W.I.N.O are obvious. Carlin very likely was one of the DJs who played the record before it was banned from the airwaves. 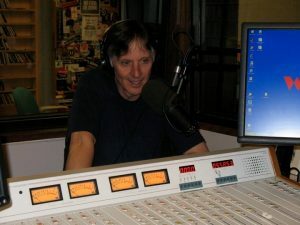 His next gig was at KXOL in Fort Worth where he worked the 7 to midnight slot. His audience was largely teenagers and Carlin had a rapport with them, taking song dedications and giving high school football scores on Friday nights with his show ”The Hi-Fi Club.” His fictional “Wonderful W.I.N.O. broadcasts were clearly aimed at imaginary teen audiences containing satirical “beach movie” promos, acne commercials, etc. While at KXOL, he was featured in ads on benches at bus stops; sometimes, ironically, covered by sleeping winos. He started infusing more comedy into his broadcasts. He developed a recurring character he called the “Hippy-Dippy Weatherman, with a mystified voice of a stoner, who did bizarre lampoons of weather reports. After a few months at KXOL, he went to L.A., working at R&B station KDAY. He wrote comedy bits about current events which he did during his show. Performing at an L.A. club, he was spotted by Lenny Bruce, who was so impressed, he contacted his agents at GAC and suggested they represent Carlin immediately. They did. Because of this, Carlin was able to take his finely honed characters and record his 1967 album “Take-Offs and Put-Ons” which became one of the biggest-selling comedy records of the 1960s. It contained the fruition of his years of radio experience, including his signature “Wonderful W.I.N.O. routine, complete with the lightning-fast delivery of DJ Willie West, with his “stacks and stacks of wax and wax…” It was nominated for a Grammy in 1968. The rest, of course, is comedy history. Carlin became one of the biggest voices in comedy; a legend. Unlike Walter Mitty, Carlin had achieved his dreams and fantasies…along with Al Sleet, Willie West, Biff Burns…and all the other characters who helped get him there. Other people may keep them as they are handy for scooping up a dead spider…or leaving at homicide scenes to throw police off the track. Your business card is a succinct resume. For a comedian, it should contain something that will make the person smile, laugh, or snort milk through their nose…It can be a humorous graphic or a short witty remark such as…”have jokes, will travel”…”will tell humorous limericks for food”…”Master of Mirth”…or even something that is actually funny. Once upon a time, a comic could audition live…in person…in front of another live person. You knew immediately if club managers thought you were funny…they would be laughing. Using this barometer, you also knew if the guy mopping the showroom floor thought you were funny…or if the waitress setting out the silverware on the tables thought you were funny. As a matter of fact, the manager would often confer with the custodian who would confer with the waitress and then they would each rate you on a scale of one to ten, each holding up a card with their individual scores and if you got a combined score of at least 25 you were booked. It was a simpler time. Then technology reared its ugly 4-head VCR and a new generation of auditions began. Club managers or bookers would no longer audition you in person, nor would the custodians or the waitresses. You had to film yourself performing a comedy set and mail it to a club…or janitorial closet…or table #3…and wait for someone to contact you. You might not hear back for 2 or 3 months…maybe 2 or 3 years…maybe never. Just be patient. Nowadays, many demos are taped with small digital camcorders and sent electronically via your computer which makes it easier for you to film demos at open mics. It also means you can send it to a hundred booking agencies at the same time, greatly increasing the expeditiousness of your rejections.